Mr. Chowdhury is the president and an investment consultant at Canterbury, serves on the Board of Directors, and is a shareholder of the firm. In his role as president, Mr. Chowdhury is responsible for firm strategy, consulting, investment research, and business development. He consults directly to institutions and private clients in the key areas of investment policy, asset allocation, and portfolio construction. Mr. Chowdhury is a member of the Global Equity and Hedge Fund Manager Research Committees. Prior to Canterbury, he was part of the advanced advisory services division of American Express in Minneapolis, Minnesota, and was also a contributor to the Human Genome Project while working in the Department of Pharmacology at the University of Minnesota. While there, he was lead author of a paper published in the Journal of Neuroscience Letters in 1995, Synaptotagmin I and 1B4 are identical: implications for Synaptotagmin distribution in the primate brain. He presently serves on the boards of the Child Abuse Prevention Center of Orange County and the Mission Hospital Foundation. Mr. Chowdhury received his Bachelor of Science degree in management and economics from the Carlson School of Management, University of Minnesota and is a CFA® charterholder. Typical investment committee members are program related or investment related. Our program-related members would like to use some of that growth income to build the new wing or initiate a new program. Our investment-related brethren want to safely grow our nest egg for the future. Of course members generally meet in the middle somewhere to accomplish both program funding needs while addressing asset protection. A good investment policy statement (IPS) will outline goals, target returns, acceptable risk, performance measurement guidelines, and key policy requirements as set by the committee. The statement should also set the parameters for meeting agendas and decisions. The chairperson will verify the committee is working within the guidelines of the statement. It’s important to note that goals need to be organized so that risk and return and are easily measurable. A typical goal will state a real return expected and the strategy that is expected to achieve that return. Hold true to your investment policy statement despite what the market is doing. The first step is a group of committed members. As a starting point, members need to be committed not just to the organization and its mission, but to the idea of working together – not as independent entities, but through honest teamwork and consistent participation. Let’s talk personnel. The idea is to build a diverse and skilled committee. Of course, we’ll need our organization’s committed folks who live and breathe the mission, but an ideal group is not one that primarily consists of investment professionals. Contrary to popular opinion, non-investment professionals can provide diverse viewpoints and ask questions that require investment professionals to clearly articulate their thesis. Regular communication is key to success. On that topic, it goes without saying that all members’ opinions should be heard and no one should be bullied into a decision. The committee chairperson needs to lead by example and allow flexibility for alternate viewpoints to be vetted. Growth investing will definitely provide returns short term, but a bull market as long-in-the-tooth as we have today could easily retreat. Can an institution afford a 20 percent decline in returns and still meet the prior obligations from a time of rosier returns? So what should our strategy be? Our goal should be to focus on the fundamentals of investing: Clear appropriate investment goals; diversified asset allocations; low costs; and perhaps most importantly, long-term discipline. I suggest that we adhere to our most important document, our IPS. In our statement we will have addressed our portfolio rebalancing procedures that will guide us through the uncertainty that’s always present. When “groupthink” wants to chase performance, the investment consultant can provide insight and reason. A fiduciary has a duty to ensure fiscal health of the organization is strong and well managed. This is best exemplified by a financial advisor or manager who is a true fiduciary, motivated by the mission, not commissions. A true fiduciary will make recommendations based solely on what’s best for the institution and not for their own personal gain financially or otherwise. To avoid problems of impropriety and perhaps poor performance, an investment board should have a strict rule prohibiting an investment in any product that economically benefits any committee member. This eliminates the potential for conflicts of interests and resolves many personal biases. Sometimes an investment committee will have individual members who will react or advise on the basis of their own portfolio experience. 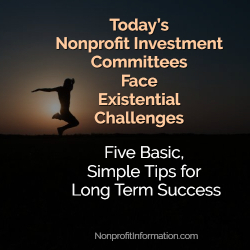 The investment approach used for an individual is not appropriate for a nonprofit investment committee; many alternate investment approaches good for individuals are not well suited for the institution’s infinite horizon portfolio. Again, have a clear mandate for the investment committee as outlined in the investment policy statement. Regular rebalancing of the organization’s portfolio should be done in accordance with the investment policy statement and not solely to market events. Above all, avoid groupthink as it can lead to a team that doesn’t challenge or disagree. Contrarian thought can produce successful investment results. Give special thought to new committee members and turnover. Properly screen new members to vet for strong-willed personalities who might seek to dominate the agenda. Once installed on the committee, new members need to be properly trained and oriented to the organization’s financial goals. Sometimes new members with the right skill set can make a world of difference. Historically, value-based investment strategies have worked to effectively allow nonprofits to continue to fund their mission. Many think some previous comparisons to earlier markets are irrelevant in this age of instantaneous computer-aided trading. I agree with the quote famously attributed to Mark Twain: “History doesn’t repeat itself but it often rhymes.” Stay disciplined with your value-oriented portfolio. Canterbury Consulting is a leading investment advisory firm overseeing more than $18.3 billion for foundations, endowments, healthcare institutions, and families. Founded in 1988, the company designs and manages custom investment programs aligned with each client’s goals. Canterbury acts as the investment office for its diverse clients and provides objective investment advice, asset allocation, manager selection, risk management, implementation, and performance measurement. Canterbury Consulting strives to deliver performance and service that exceeds the needs and expectations of its clients. Learn more about Canterbury Consulting at www.canterburyconsulting.com.